Not got much time or just want the bullet points on how to do this paper fireworks activity? Click here for the Quick Read Instructions. 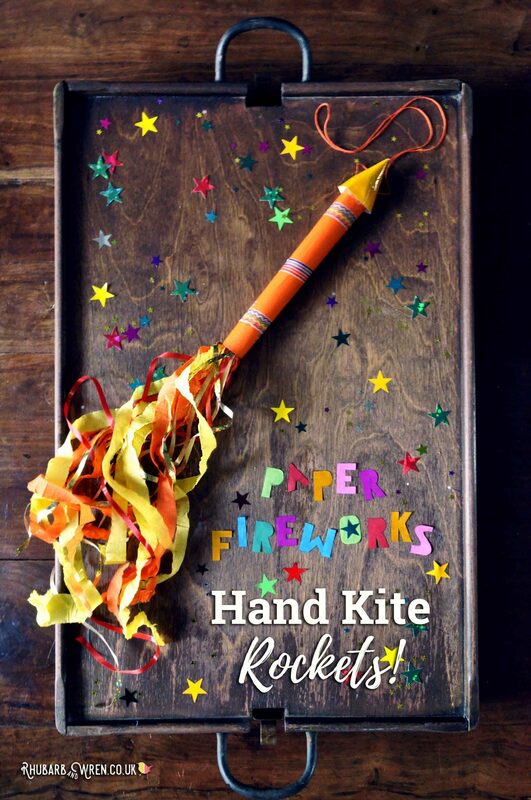 Why make a decoration, when you can make paper fireworks hand kites to fly instead! 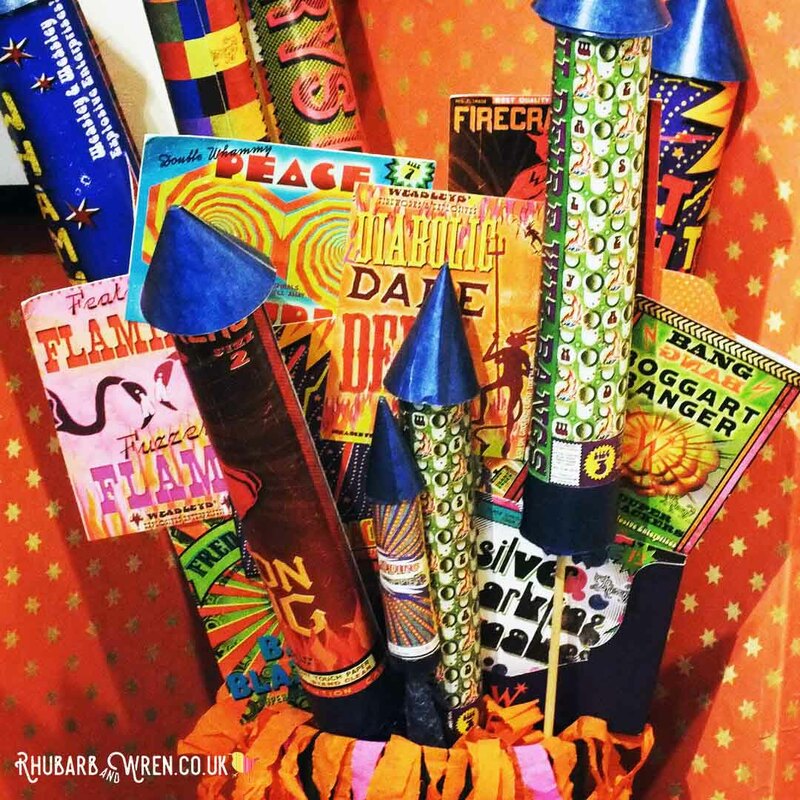 In order to find inspiration for our paper fireworks craft, and because the old designs are just so great, we’ve studied pictures of vintage fireworks as an example of what fireworks look before they go bang. 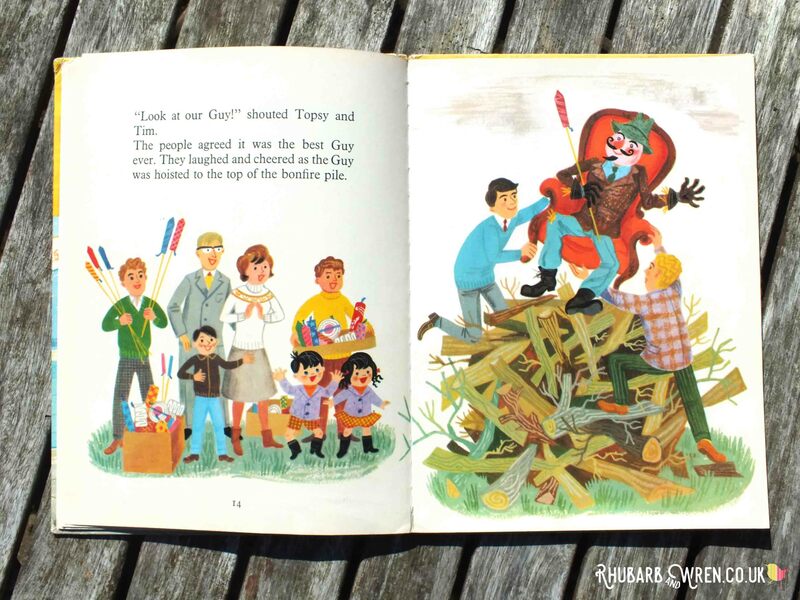 Our classic Topsy and Tim’s Bonfire Night book is full of great – if retrospectively unwise – images, for example. What is wrong with this picture? A great example of 60s nonchalance towards fireworks safety in this vintage Topsy and Tim book. And I’m betting nobody checked for hedgehogs either. Our original inspiration, however, came from a trip to the marvellous art gallery / shop, MinaLima, in London, where we got to see a whole bucketful of ‘Weasley’s Wizard Wheezes’ fireworks props, just waiting to be set alight… Anything Harry Potter related is an instant hit with my kids, but as, alas, we couldn’t take those bangers home with us, we made our own paper fireworks instead! Our paper fireworks hand kites evolved over a few Bonfire Nights. 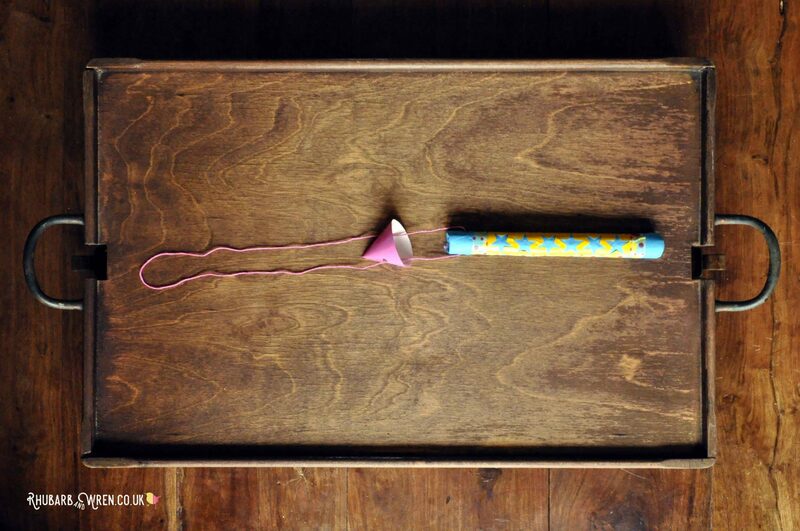 Starting as simple toilet roll firework rockets, we’ve developed our fireworks craft into versions mounted on sticks, and then to the latest (and, I think, best) version – the hand kite! Heavily influenced by Japanese Koinobori (traditional ‘carp streamer’ windsocks), these hand kites are easy and safe for little ones to whizz around. Just like real fireworks! Toilet roll tube or no toilet roll tube? 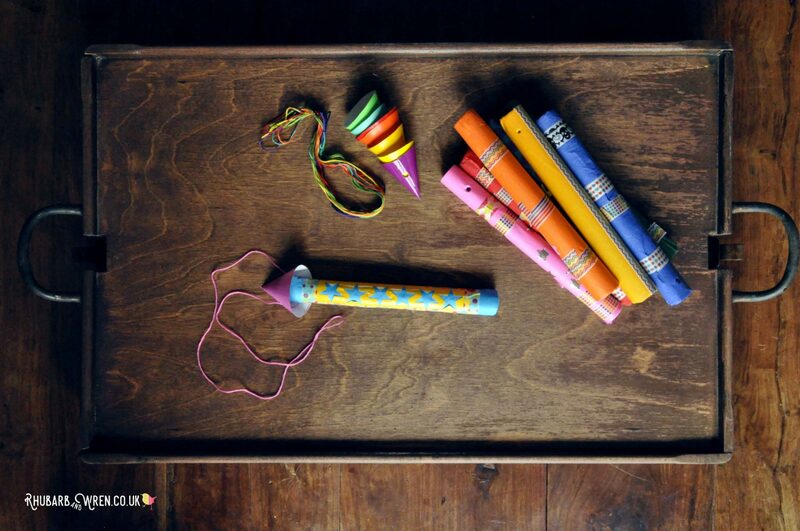 You can use a toilet roll or kitchen towel tube for this paper fireworks craft. However, we prefer to roll our own tubes out of thin card or paper. Making them this way means you can have thinner rockets, which we prefer, and it also gets the kids using a little more fine motor skills in the process. But go ahead and use toilet rolls instead if you like – they’ll work just as well! Product links in this article are Amazon links to materials I used to make our paper fireworks craft. These are all affiliate links. You can find out more on my ‘about affiliate links’ page. We used tissue and crepe paper, stickers and washi tape to make our paper fireworks. • Paper or thin card. 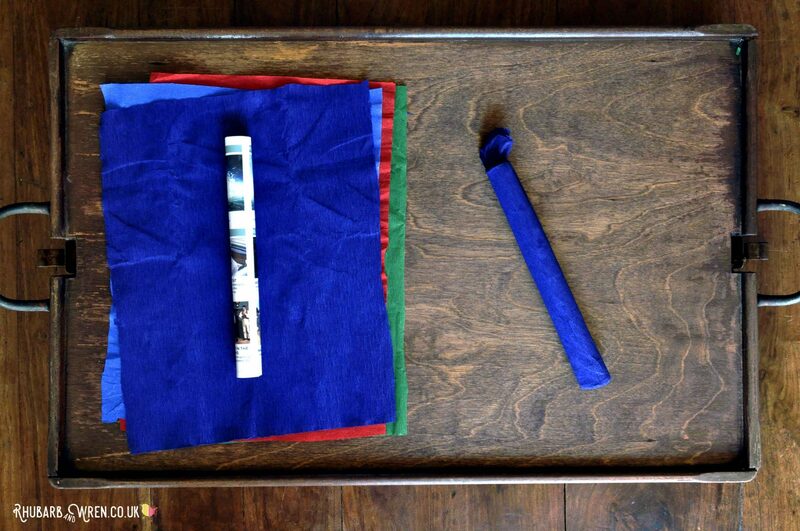 An old magazine or catalogue works perfectly for this fireworks craft, as any images will be covered up later anyway. 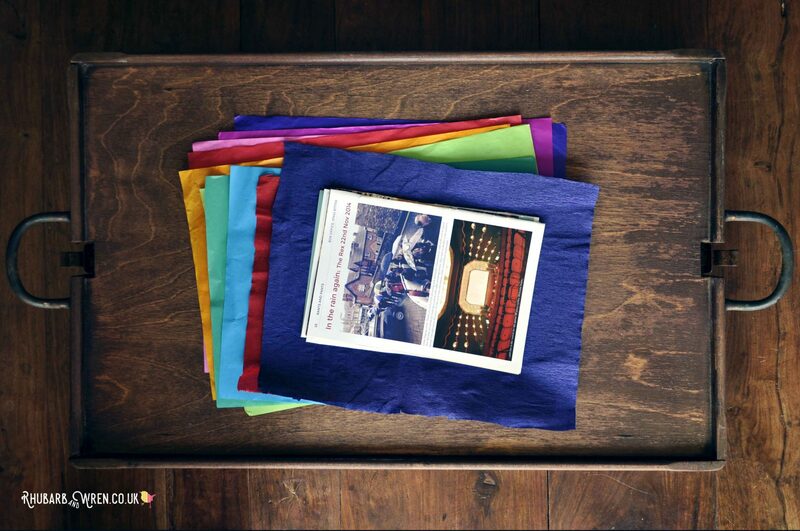 • Colourful crepe, tissue paper or wrapping paper. 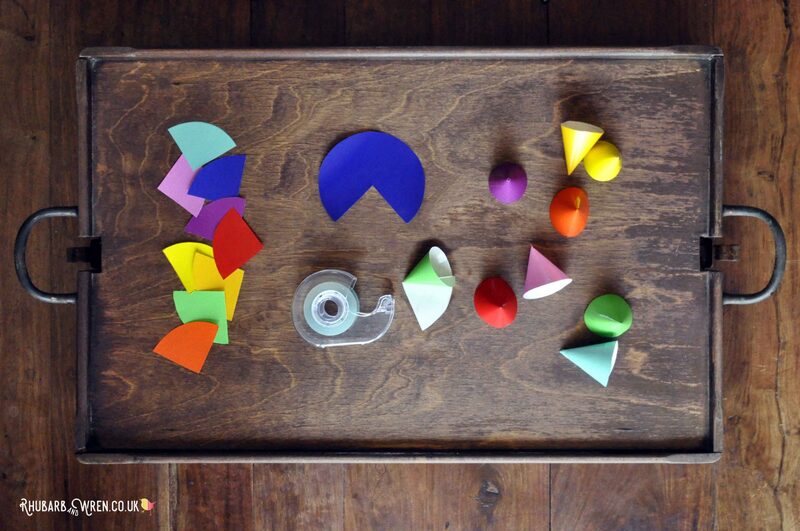 • Washi tape, coloured tape or stickers for decoration. • Streamers for the tail. 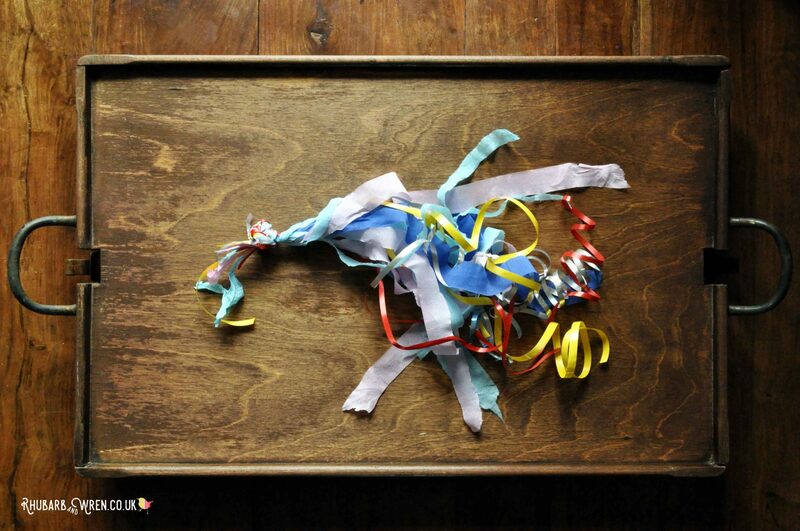 Use ribbons, tinsel, coloured wool… or just cut thin strips from your crepe/tissue paper! 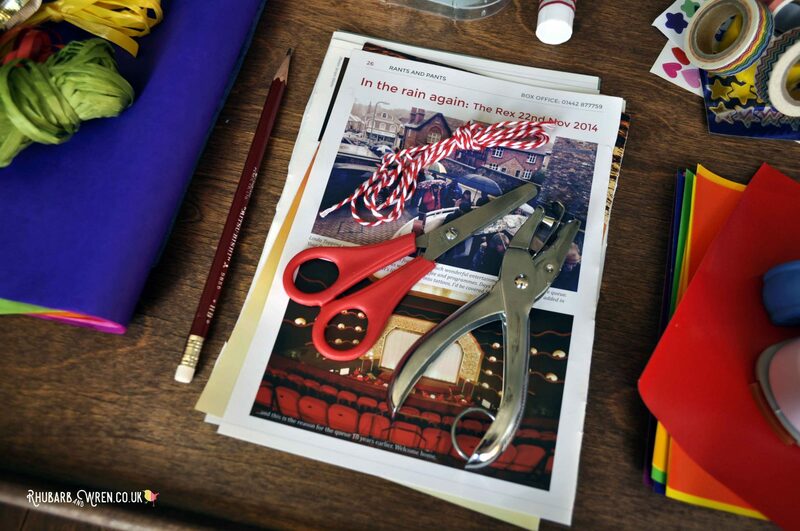 Scissors are all you need, but a hole punch or two comes in handy! 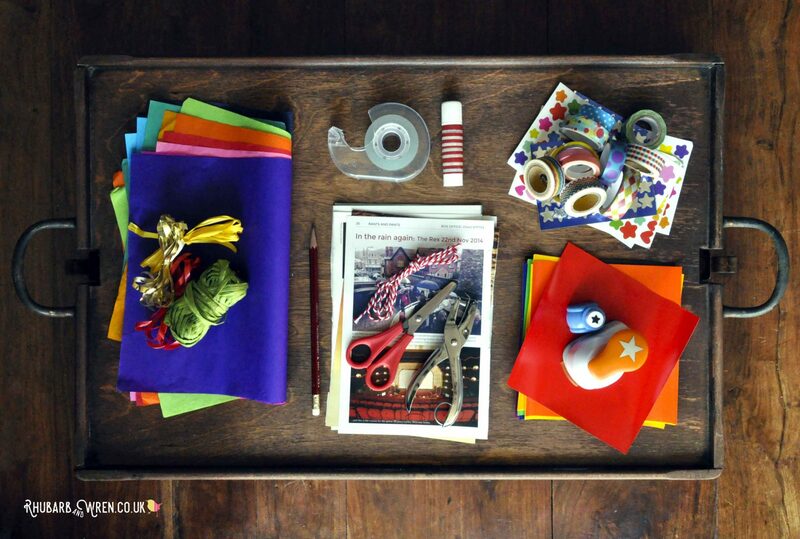 This fireworks craft is a great project for using up crafting scraps and recycling bits from around the house. So don’t feel that you have to buy anything especially for this project. Raid your recycling bin for supplies instead! 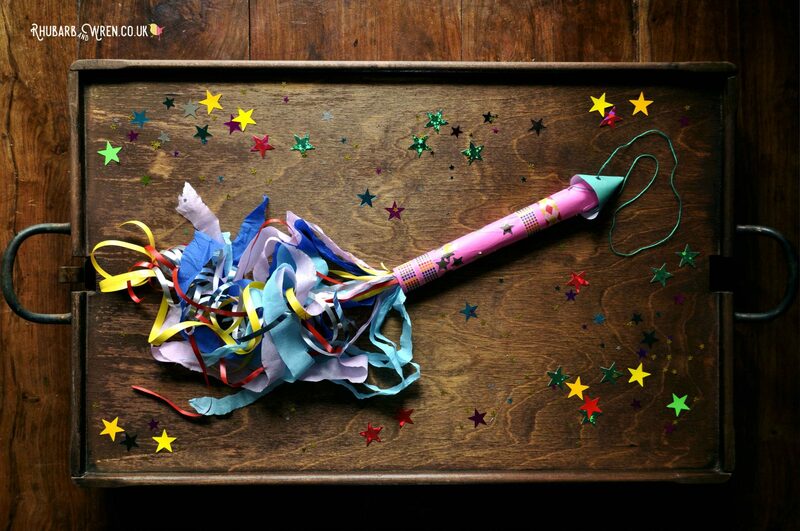 To make the body of your paper firework, roll your paper into a thin tube and use a bit of sticky tape to secure it. The tube for this paper firework can be any size you want. For reference, we used A5 paper (old brochures) for our rockets – so roughly 20cm/8 inches long and rolled as tightly as the kids could manage. Pages from an A5 brochure are perfect for this fireworks craft. If necessary, I get my kids to cut the paper down to this size beforehand just so it’s easier to roll. This fireworks craft makes lovely scissor skills practice, as it really doesn’t matter if any of their lines are wonky. 2. Cut the crepe / tissue paper. 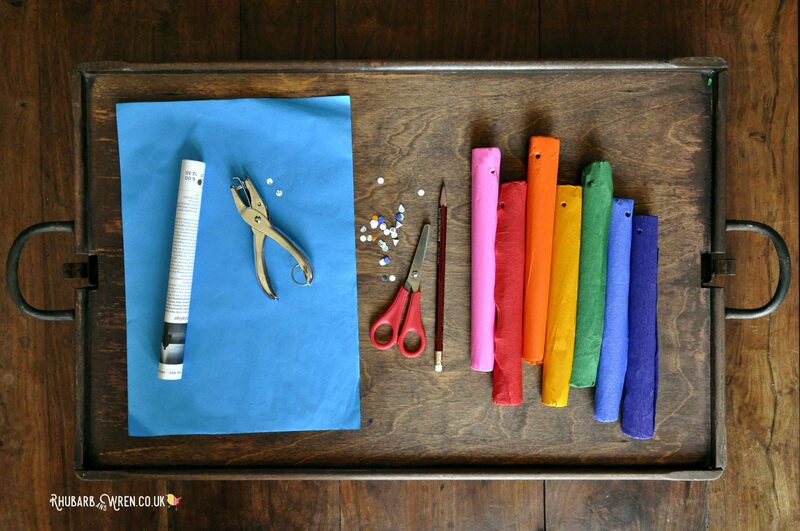 Get the kids to cut a bit of colourful crepe paper or tissue paper so that it’s a good 10cm / 4 inches longer than their tube. A4 size works perfectly for this if you’ve used A5 paper for the tube. Coloured paper of any sort makes a great cover – or how about painting plain paper with their own patterns? The kids will need to place their tube on the edge of the crepe/ tissue paper, with roughly equal overhang at either end. Have them roll the tube in paper, and then tuck the ends inside the ends of the tube to hold it in place. Use any type of colourful paper to wrap your tube – tissue, crepe, wrapping paper… or alternatively, paint it! Cut two holes at one end of the tube. 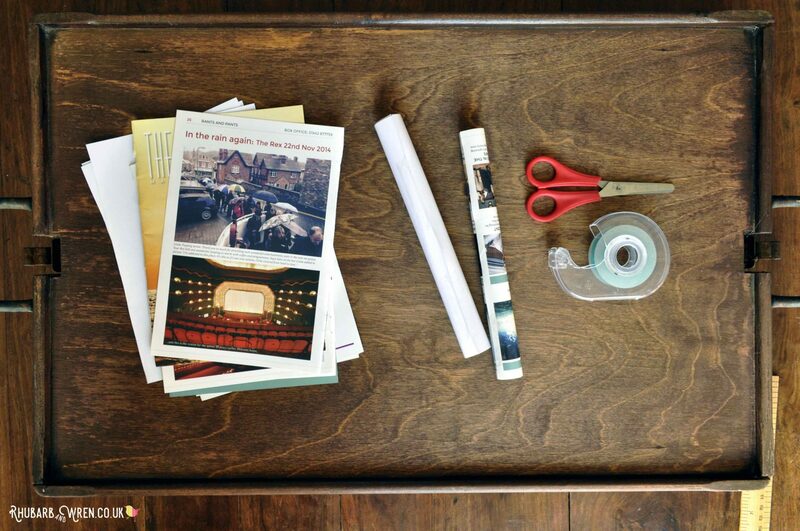 Use either a hole punch or snip a hole with a pair of scissors. This can be tough to do if there are lots of layers, so you may have to help the kids. It can be easier to make the holes before you wrap the tube in colour paper. If you do this, just use a pencil or other pointy thing to poke through the wrappings, so as to reopen the hole after you cover it up. Use scissors or a hole punch to make two holes in each tube. 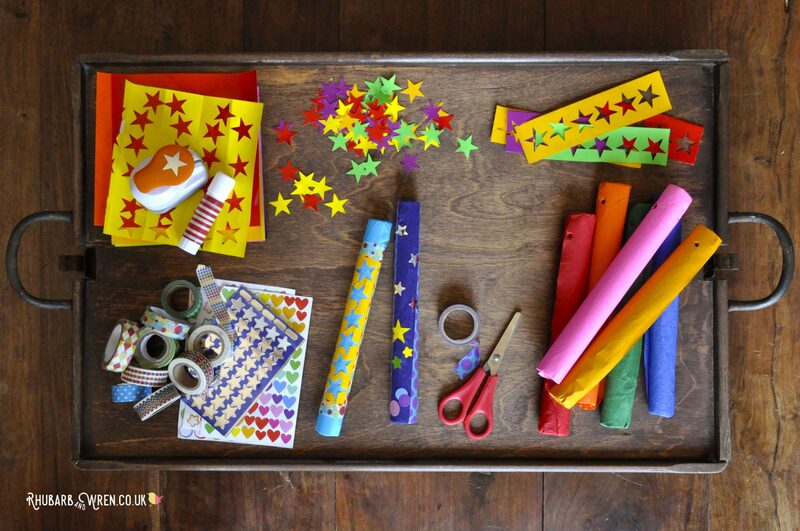 Now the kids can use their washi tape, coloured tape or stickers to decorate the body of their paper firework. This is where our earlier research comes in useful to give the kids an idea of what a real firework looks like. Not that they have to stick to that, of course! 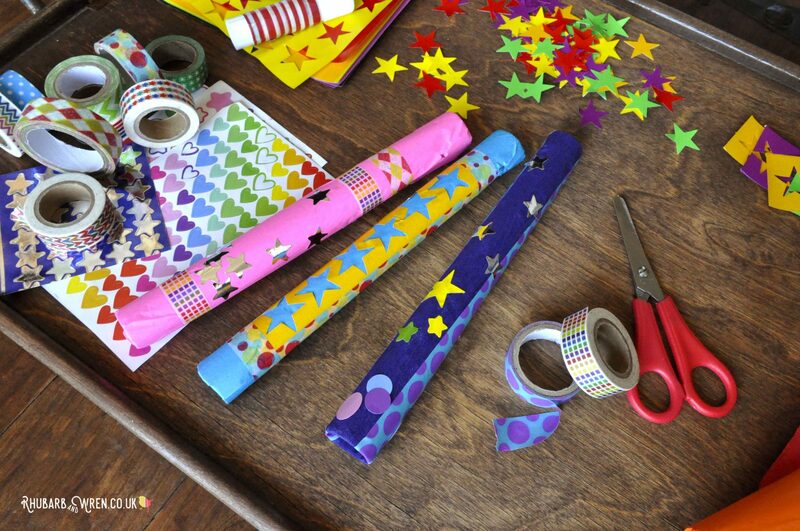 My kids love colourful stickers and washi tape, so this fireworks craft is right up their alley! Washi tape or coloured tape is great because it also helps secure the crepe paper covering a little more. But stickers are also fun for kids to use, and cheap gold/silver star stickers work wonderfully with this theme. 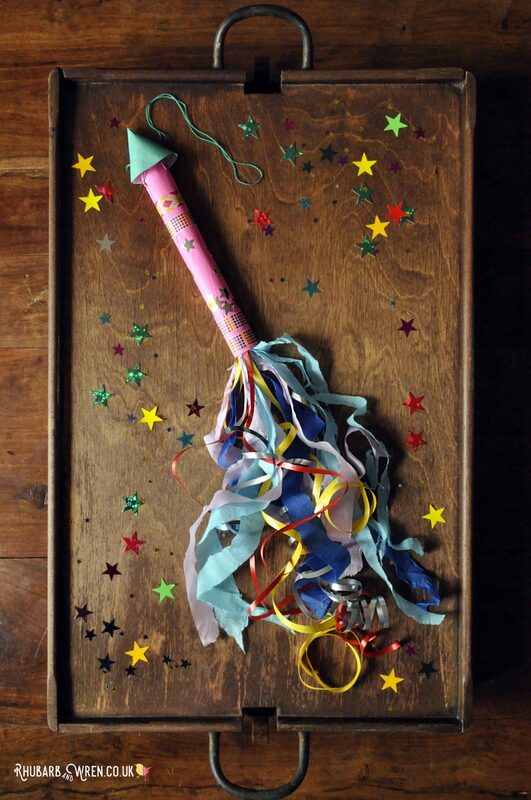 Fireworks are almost as pretty before they go off as afterwards, so let the kids go crazy with decorations! 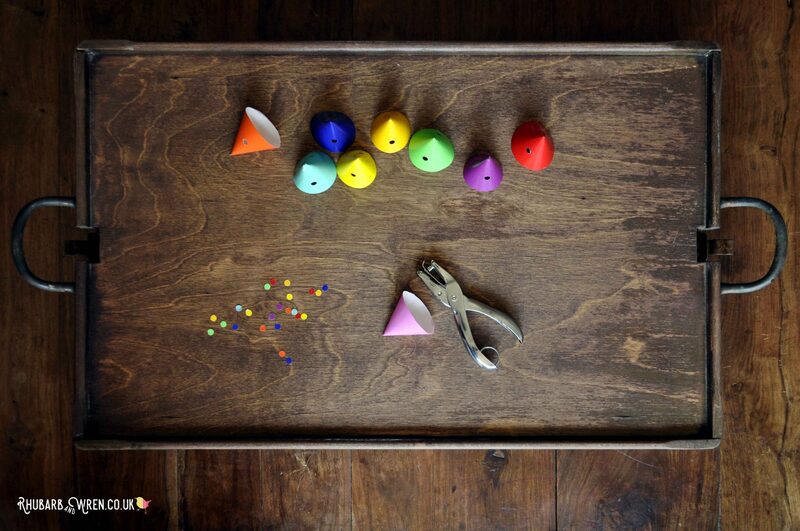 Or alternatively, the kids could use craft punches, like our star-shaped cutter, to make their own colourful decorations that they can then stick on with a bit of glue. Colourful caps for the end of our paper fireworks! My kids are adamant that fireworks have little pointy hats (the downside of all that research and inspiration is they now know what they’re talking about!). 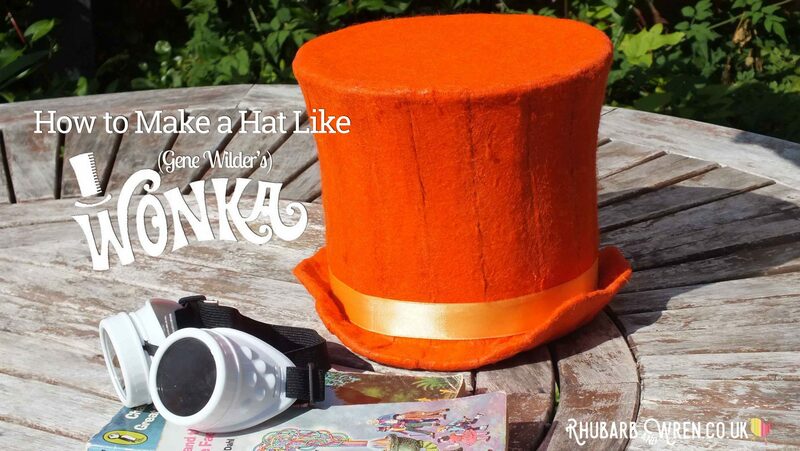 You can leave this off and the firework will look just as good, but if your kids want hats for their paper fireworks, this is how we made them. 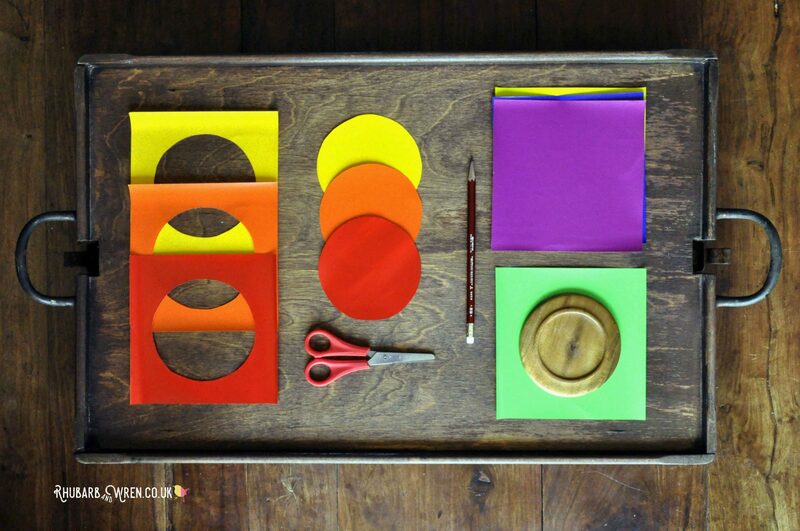 • Cut a circle out of coloured paper or thin card (tissue paper is too thin). Use contrasting colours for a fun effect! 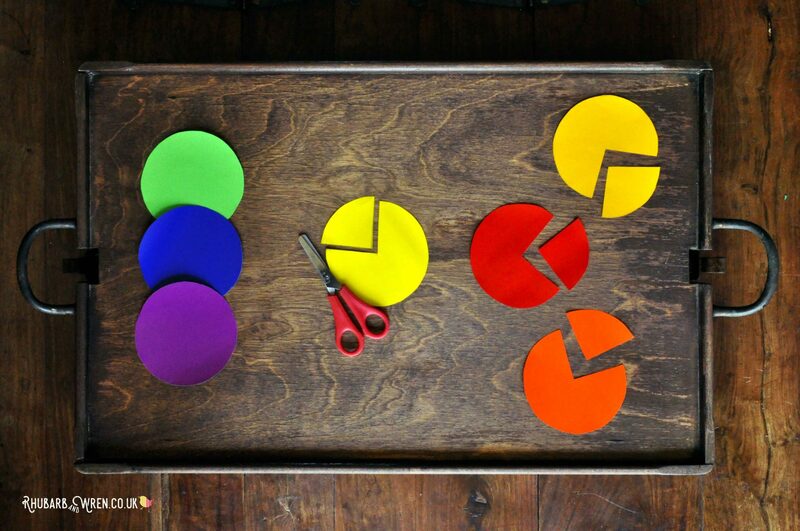 • Find the centre, and then cut away roughly one quarter of the circle. You can cut out a bigger section if you want a smaller cone for your firework. • Use what’s left to form a cone, and secure with a bit of tape. 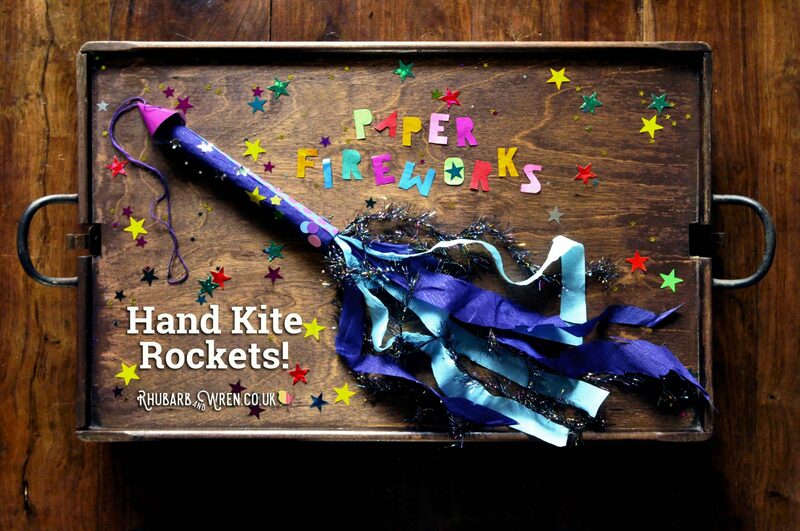 A simple nose cone adds that final rocket-y-ness to their paper fireworks! • Cut two small holes on opposite sides, about half way down. These are for threading the string handle through. • Thread your string through the holes. We used embroidery thread as the kids wanted string to match the colours of the caps! You want both ends to dangle down from the INSIDE of the cone, with a large loop of string (forming the handle) on the OUTSIDE. So once the cap is made and threaded, the kids can join the cap and tube together. Get them to take those ends of string dangling from inside the cap and thread them through the two holes in the firework tube. You don’t have to use matching colours, but my kids insisted! Make sure that, just as with the cap, they thread the string from the OUTSIDE in, because next you will knot the ends of the string together and you want the knot to eventually sit inside the end of the tube. Thread your string from the outside in, on both your cap and tube, and knot the ends together. Once the two ends are threaded in, knot the ends together to finish the loop, and pull the string back out from the top (cap end) as far out as it will go. You can stick your cap down onto the tube to hold it in place, or just leave it loose. 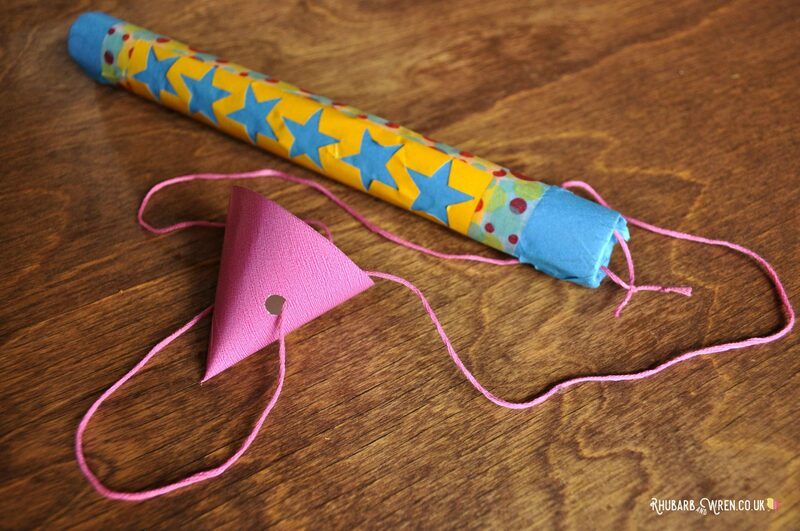 Push the cap down the string onto the tube, and this paper firework kite finally has a hat and a handle. Cap, meet tube… Half way done! Their rocket won’t be much of a firework or a rocket without a tail! 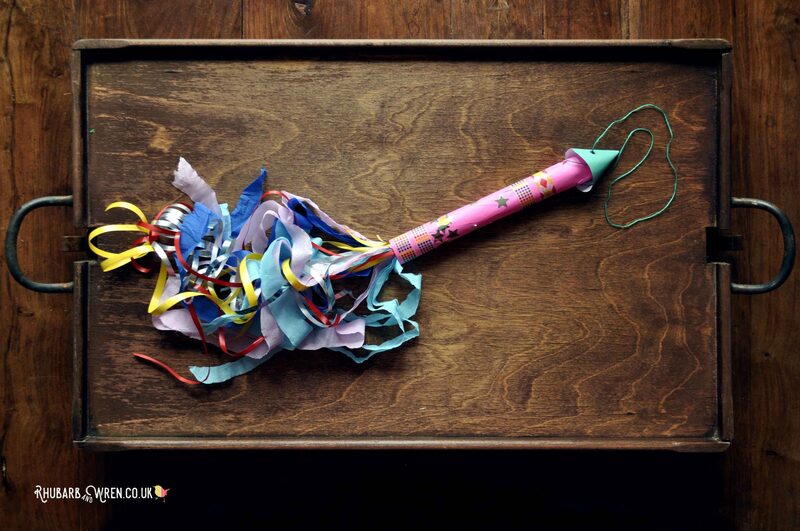 So, to finish off their firework hand kite, they will need to use bits of parcel ribbon, colourful wool/yarn, strips of tissue/crepe paper or even old tinsel to make a tail. 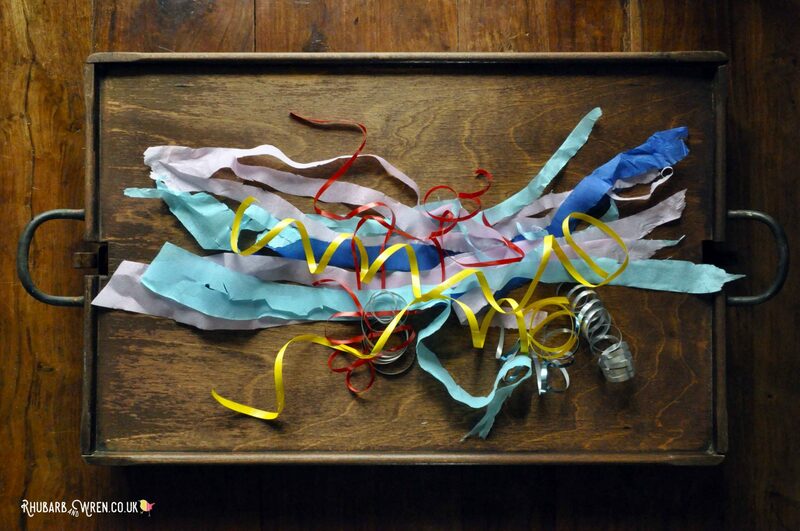 Bundle together colourful scraps and streamers to make a really spectacular tail! The streamers can be cut to any length you like. Ours were about 50 or 60 cm (roughly 24 inches) long, but not all were the same length as we liked a bit of a raggedy look! Once the kids have gathered or made and cut their selection of streamers, knot them at one end to secure them all together. 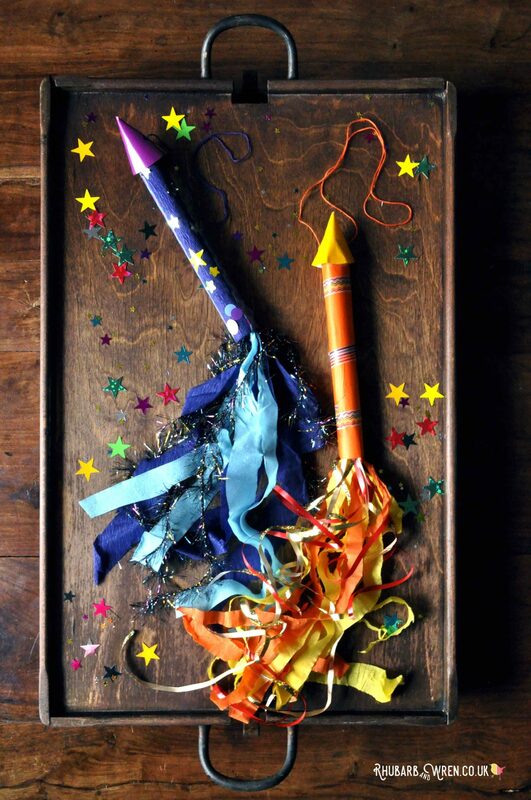 Scraps of fabric, ribbon or paper streamers all make great firework tails! Then, simply push the knot into the end of the tube without the holes. The advantage of thinner tubes is that this is usually enough to keep the tail in very securely, but if it needs a bit of help, roll up a ball of paper and push it in with the knotted end. This should keep everything safely in place. Kids won’t need much help figuring out how to fly these babies! Just swing ‘em round as fast as you can and they fly like perfect paper fireworks through the air. Incidentally, the first time we did this paper fireworks craft, we poked a long skewer or thin stick into the middle of the tube instead. This worked okay for a while, but eventually we found that a particularly exciting wave will launch those rockets into space. On the plus side, though, you could control the rocket much better with a stick, and so making them this way allows you to ‘dance’ your firework in lovely patterns. 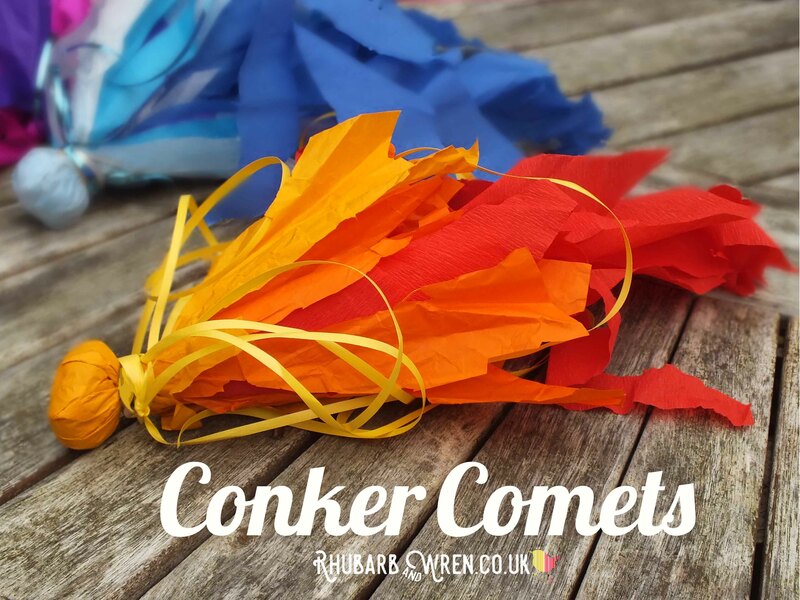 If you’re looking for more fireworks crafts to do with the kids, take a gander at our fabulous, all-time favourite autumn activity – making Conker Comets. A quick, easy and fun autumn conker activity to use up all those wrinkly old conkers! What we love about these is that they really do fly because you lob them through the air! What you need to be aware of, though, is that they really do fly because you lob them through the air… So while this one is the easiest and most fun autumn craft you can do, it’s definitely also an outdoor activity! Want even more fun things to do with the kids? Then take a look at these great activities as well! 1. Make a paper tube. 2. Cut a rectangle of tissue paper longer and wider than the tube. 3. Wrap around the tube, tucking the overlap into the ends securely. 4. Cut two holes at one end of the tube. 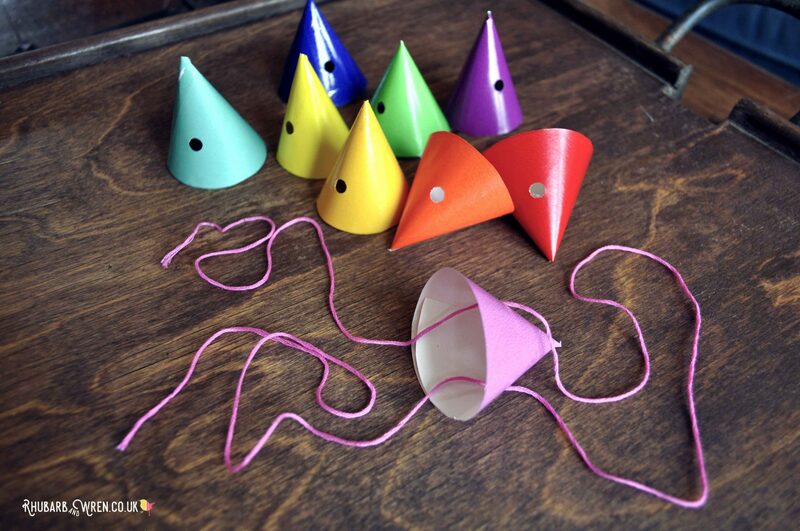 ● Cut a circle of paper, remove one quarter, then form into a cone. 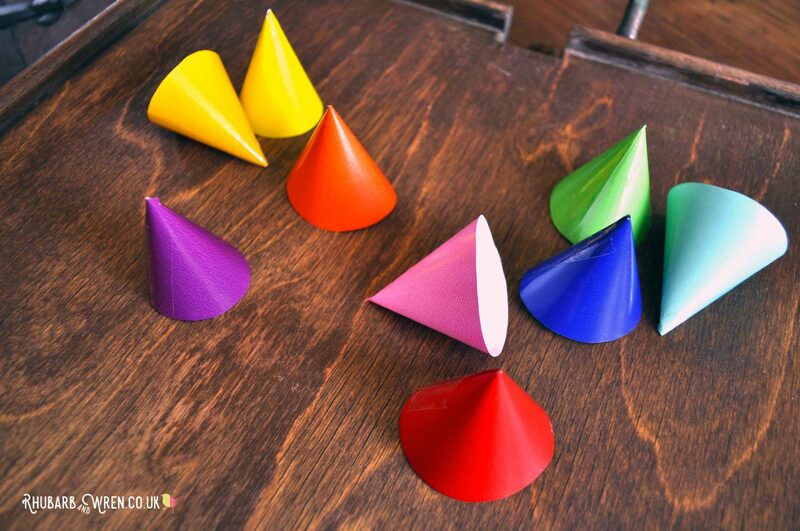 ● Make two holes on opposite sides of the cone. ● Thread string through, ends dangling from inside. 7. Pull the string ends through the tube holes. Knot ends together. Push the cap onto the tube, pulling out the string loop, making a handle. 8. Knot the streamers into a tail and insert into one end of the tube. Now, go fly your firework hand kite! 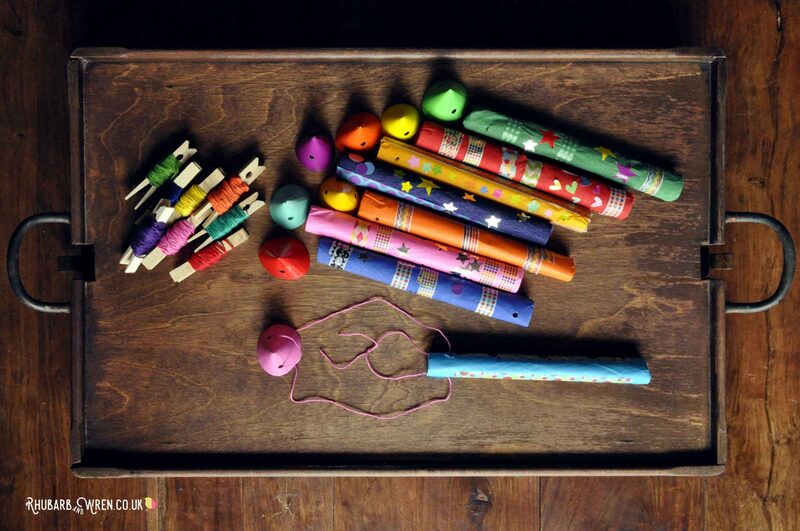 Want to bookmark this paper fireworks activity for later? Save this post to Pinterest! 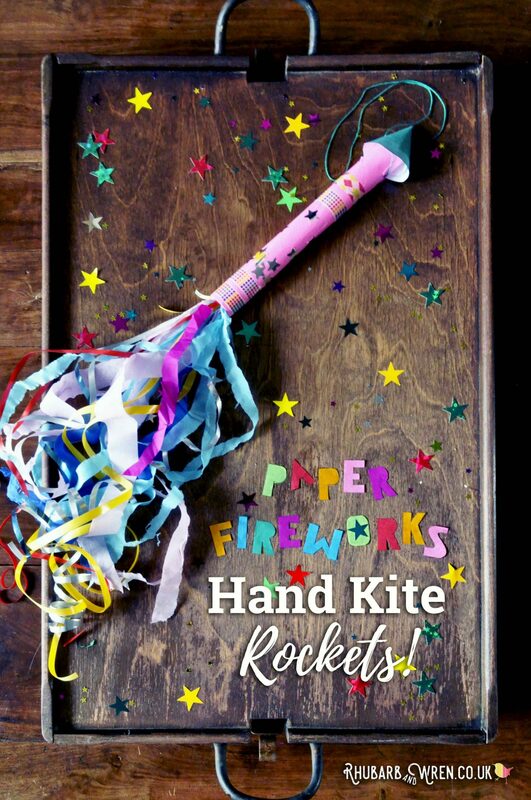 These fabulous fireworks hand kites are great fun – kids can whizz them around just like the real thing! 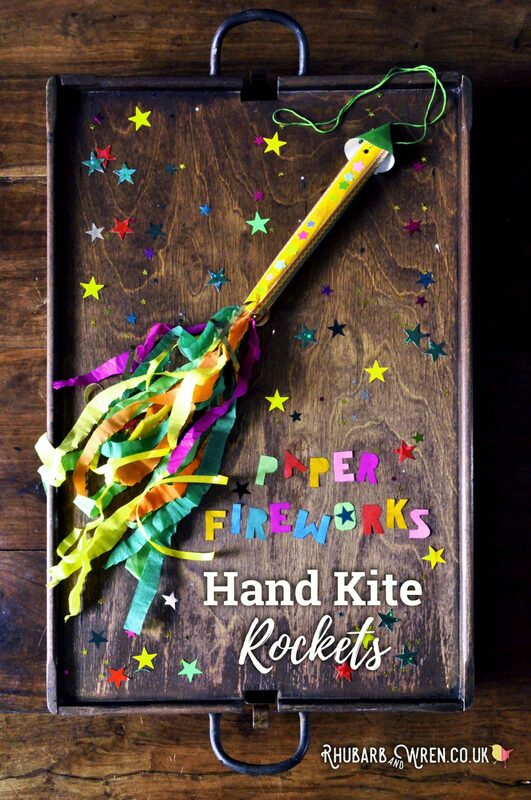 These super-duper paper fireworks aren’t just for decoration – grab the string and kids can whizz these hand kites around, just like real fireworks! 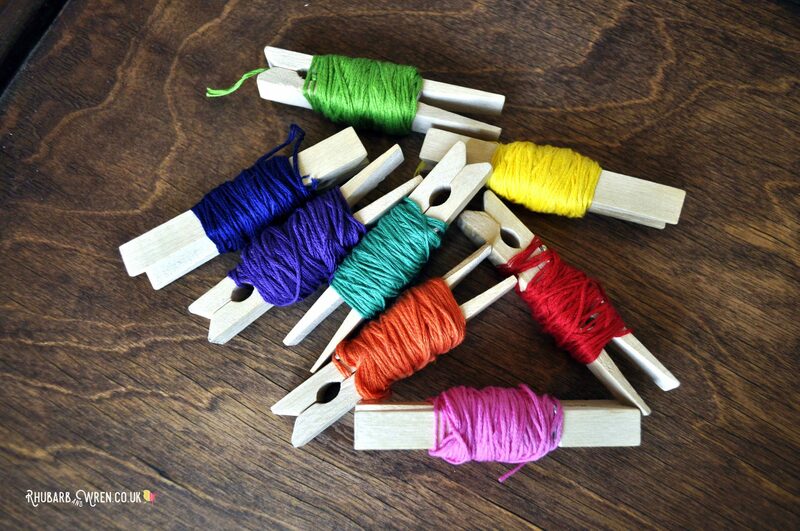 Find out what you need for this simple but fun craft over at Rhubarb and Wren. Oh wow these are amazing! I can’t believe we’re almost at Bonfire Night – where is the year going?! 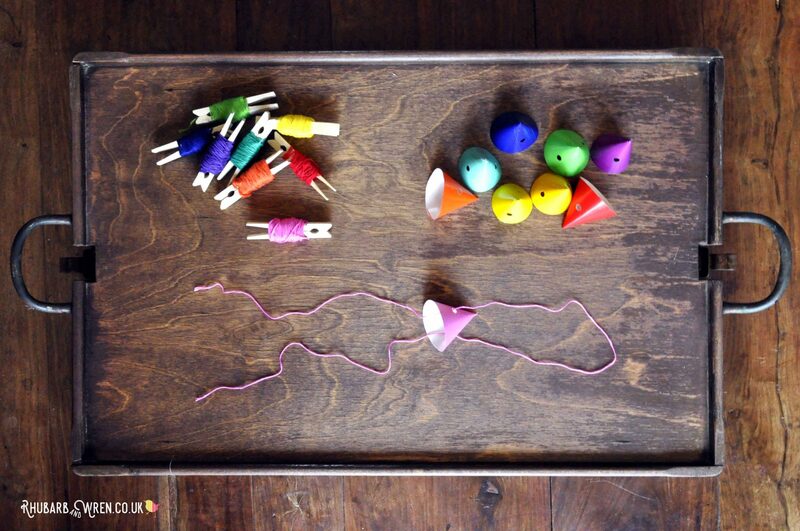 These look like so much fun to make and great decorative pieces too! Definitely a much safer option this Bonfire Night! Thanks for sharing! Wow, these are really cool. I will be trying this out with the kids this weekend. I might give the conker comets a go too. Oh wow! These look fab and your styling is immense, such detailed instructions too. My girls would love to make them. What a lovely fireworks night themed activity. I’m always on the look out for something new to try. We’ll have to give this one a go.